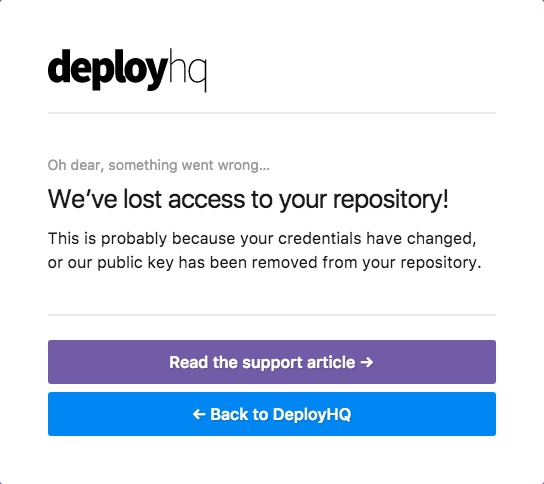 This error screen can display if DeployHQ is unable to connect to, and authenticate with your repository. This often occurs when trying to edit a server, because DeployHQ needs to connect at this point to be able to obtain a list of current branches. To troubleshoot this issue, it's recommended that you first check to ensure your project's public key, found via the Configuration page, has been uploaded to your repository host. We have specific documentation covering how to check both the repository URL, and the public key in this page in our documentation.